I got this recipe years ago from the old TSR recipe board. This is delicious on hot rolls, biscuits or toasted English muffins. Beautiful addition to holiday gift baskets too. In a heavy 3 qt. saucepan, bring to boil cranberry juice, sugar & orange rind. Boil gently for 10 minutes. Stir in honey. Bring to rapid boil & boil 1 minute. Remove pan from heat. Stir in liquid pectin; skim off any foam. Pour into hot, sterilized jelly jars. Seal. Makes 5 (6oz.) jelly jars. Let me tell you! This recipe is AWESOME! It isn't tooo spicy. We love this and I am always asked for this recipe! Tremendous! Mix spices together and season the roast. Place in crockpot. Add remaining ingredients and cook on high for 5 hrs. or low for 7-8 hrs. Remove roast and shred with a fork,return to crockpot to heat through. Serve with enchiladas,tacos or crusty rolls with sauce for dipping. Click on the grahpic above for more crockpot recipes! Todays directive is an easy one! It is to relax! lol Tonight just might be a great night to do that! We in Western Washington have enjoyed one of the most beautiful Octobers EVER! We have have very little rain and the sun has been shining and the colors, well they have been just magnificent! But today, we are back to our normal, rainy, drizzly, DARK day. The golden leaves that have been piling up under the tree in the island in our work parking lot have lost their crispness and are smushing down with all the moisture. I will be thankful for our prolonged Indian Summer and remember that today. So with the darker day and the rain, I think tonight might be a good night to get dinner done and hunker down with a good video with the hubs and our golden. Hopefully he is coming to the end of his strike and after tomorrow's vote will be returning to work on Monday. It is a pretty quiet night in our neighborhood as we are only 1 of 5 homes and the top of the hill and no kids! Have you been following the 100 Days to Christmas? Check it out and see what others are doing to plan! Last night I got my list of recipients for the dolls. I grabbed my storage container with the materials and began to see what I had and what I needed. I need 2 more sets of button eyes, lace and dress material for 4 dolls. Everything else is pretty much there! I may need to get more double knit for the doll face and body, so today, I will be researching on line where to find that. JoAnns did not have anything that I liked last time I looked there! The elastic, ribbon is all in place! :) This week I will begin cutting out the dolls. I am thinking of cutting out all that I need and putting each of the pieces in a labeled LARGE ziplock bag tagged with the name of the recipient and keeping those in a storage basket next to the sewing machine. :) I am anxious to get started! Make and Takes is giving away the dress, above, from Shabby Apple! Click on over to her blog to leave a comment and get a chance at winning! Hurry, because today is the last day to enter! It is getting closer! Time to really get to organizing the crafts that I am making! And I am so pleased with my newly organized craft room!!!! Ok... so down to business. The biggest project this year is the dolls! The one I am making is the one on the bottom right. This pattern is from a 1980(something) McCall's Crafts and Needlework magazine. When I originally got this magazine, I made my daughters each one and it turned out so cute. In the interim, I lost the magazine and was able to connect to the original pattern with the help of a fellow crafter on the Voy Craft Forum. I was going to do this last year and didn't get it planned out too well! lol. Recently I took the magazine to Kinkos and had the pattern enlarged to scale. It was so inexpensive to have done that I had 4 copies made! (years ago, I borrowed a whatchamacallit from the library and enlarged the pattern myself!) I would like to preserve one copy with lamination so that I don't lose this again. Tonight, after work, I am going to go out to my Craft (no longer the crap) room and start setting up my area to get started. I have the materials all organized in 2 storage containers. I am going to make 9 for sure. I am not going to make the newest baby one yet. I am contemplating making 2 more for "step" granddaughters... the more I think the more I am leaning towards this. So, have to get an area set up and begin my process. Considering how this goes, I am entertaining the idea of after Christmas, making up some more and selling them on Etsy. I have never sold anything there before. I am very excited for this project. This doll is so cute and I believe that is a timeless pattern - as cute today as it was over 25 years ago! I will be posting pictures of the finished projects here when I am done. For more Wordless Wednesday click the banners! This recipe comes from Dena. I have "known" Dena for over 10 years now. We first met on the TSR board where she posted this and other wonderful recipes! She is a fabulous cook! This is a very special bread to make for the holidays and to give as gifts. It does freeze well. Make sure you soak your Dates all night the night before you want to make this in the Brandy. All the alcohol bakes out of the bread, but leaves a very wonderful flavor in the bread. Pour in greased bread pan and top with whole pecan halves and halves of maraschino cherries. Bake at 325 for 1 hour . It's done when inserted knife comes out clean. Triple batch makes 3 loaves and one small tin loaf. Rachel at Modern Mommyhood is hosting a 12 Weeks of Christmas Carnival. Please check out her blog for more Christmas fun!!! If you are here visiting from 12 Weeks of Christmas Carnival, please stay and visit. I do have some other Christmas recipes and Christmas ideas posted. This fudge is so nummy and makes a great treat or gift at Christmas! It is definitely a 5 star recipe! 1. Coat an 8-inch square baking dish with nonstick cooking spray. 2. In a large saucepan, bring the butter, heavy cream, granulated sugar, brown sugar, and salt to a boil over medium heat, stirring frequently. Allow to boil for 5 minutes, stirring constantly, then remove the pan from the heat. 3. Stir in the pecans and vanilla. Add the confectioners' sugar and stir until smooth and well combined. Spread the mixture into the baking dish. 4. Allow to cool to room temperature then cut into 1-inch squares and serve, or store in an airtight container until ready to serve. Thank you to Crafty Sue for honoring me with this award! This award acknowledges the values that every blogger shows in his/her effort to transmit cultural, ethical, literary and personal values every day. I am honored to be the recipient! Remember to contact each of them to let them know they have been chosen for this award. I really appreciate the thoughtfulness of Sue and her feeling that I am worthy of this award! Please visit Crafty Sue on her blog! Now it is my turn to pass it on to other 15 blogs... Not at easy task at all!!!! 1. My Daughter - just starting out with her blog, Mamma Mia!!! 4. 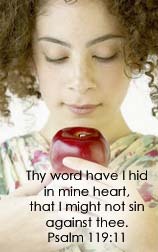 Mrs. H at In Quick Sand I feel a kinship with Mrs. H. We have some similar trials in our life and we share a love of our Lord. 5. Connie at Boondock Babble - I know you probably think I always choose her! But when you go to her blog, you will see the fun way that Connie journals her adventures in living every day! 7 Lara at The Lazy Organizer - another blogging journal that I just love her expression and sharing - and she has some darling babies!!!! 8 Marcia - The Organising Queen - she is an inspiration to declutter! 13 The Laundry? It's Never Done! 15 Diane at Where Do I Get Started?????????????? 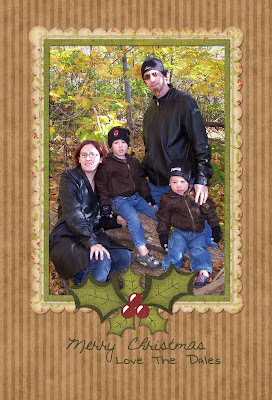 My "decluttering" friend, Amanda of Mom to 2 Busy Boys, is having a Custom Photo Card giveaway! Read more about it here and Good luck to you! Is there a time or place in your life that has such wonderful memories that it just warms your heart? My all time favorite place to live was in the home above in Lincoln, Nebraska. To this day that home represents my dream home. Part might be because this was the first home that my parents owned and their excitement and joy spilled over to us. This brick 3 bedroom home was on "M" Street in Lincoln, Nebraska. You walked in the front door and turned left to go into the living room or right to go into the dining room or if you went straight ahead, you would climb the stairs to the second story to a landing. At the top of the landing, mom kept her Singer treadle machine. Left was my room and left again went to the boys room. Right took you to mom and dad's room with a large walk in closet with a double fold door and the full bath. I spent many hours sewing baby clothes for my dolls at that sewing machine. On a warm summers night, you would find my bedroom window opened with a jar or two of fireflies that I had caught earlier in the evening. The kitchen would often smell of good things that mother baked or cooked. off the kitchen was a mudroom that led outside or to the basement where again there was a toilet and of all things a shower! The mudroom? Well, THAT I remember smelling of my brothers' stinky tennis shoes! We had the most wonderful neighbors! The house next to us on the corner was where the Marti's lived. Every year they would vacation in Hawaii and bring me back a souvenir (made in Japan!) They had the most intriquing maid. Her name was Olga and I was fascinated to hear her talk. Often I would wander next door and sit in the kitchen with a glass of milk and cookies. I remember missionaries coming to visit there one time that had a monkey! We were invited over to see their films. On the other side of us was a two story duplex. The ground floor was occupied by 2 sisters, one a "spinster" (as we called them in those days) and the other a widow. They, too, were such kind and caring ladies. I would go over to visit them and would come home with dog bones for our dog. They had a birdbath in the back yard that cardinals would visit and I loved to watch them bathe! Upstairs lived Thelma and Hugo. Thelma turned out to be one of my mother's best friends! She was a Native American. I wish I knew more of her heritage but I believe that it would be the beautiful Indians that lived in the New Mexico, maybe Colorado area that did all that lovely work with Turquoise. She was a striking woman with long black hair that she braided and wound into a flat type bun in the back of her head, high cheek bones and very slender. These were the days when life was simple and a more innocent time. The milk and eggs were delivered to our door and the milk man was a friend to someone as social as I. He, too, intriqued me as he had a glass eye! I did give my mom a scare one day as I disappeared. The milk man had come to the door and I hopped in the truck with him and did the route 3 blocks down and back again. Boy did I get a scolding for that. At that age, I didn't know a stranger! Everyone was a friend! Autumn was a beautiful time in Nebraska. The huge oak tree in the Marti's yard would shed it leaves and as the boys raked them up into piles, I would love to jump in the big, ol' cracklin' pile! Many memories were created in that home. We lived there from June 1955 to January 1961. We attended Westminister Presbyterian Church. Mom and dad were helpers with the one of my brother's youth groups so I got to go to those meetings and loved it when they were learning to square dance! Guess there were no age differences for me in those days either! Often after Sunday morning church, we would stop at the bakery (the only one opened on Sunday) and pick up sticky rolls and have friends over for coffee and rolls. I loved that as the adults all sat around the dining room table and talked and laughed and visited. We always had an afternoon supper on Sundays and it was one of two meals, either fried chicken or rump roast. Love them both! I never heard of a school bus back then. I lived on the border of the school district and walked to school every morning. The family across the street went to a different school as the dividing line was in the middle of "M" street. These were the days of party lines on the phone and you dressed up to go downtown. Speaking of going to town, I would love when we would go to Gold's Department store on Saturday as Mom would treat me to lunch in the cafeteria! Chicken pot pie was always my choice! The best I have ever tasted! I don't ever remember going out to a sit down restaurant in Lincoln. We just didn't go out much in those days. There was a Tasty Inn N Out where they served the BEST loosemeat sandwiches and that was always a treat! Dairy Queen once in awhile for a dipped cone and A & W for for a special mug of root beer! Those were few and far between, making it very special. McDonalds came to town just before we moved to Washington and they had already sold a million hamburgers before I had ever tasted one! 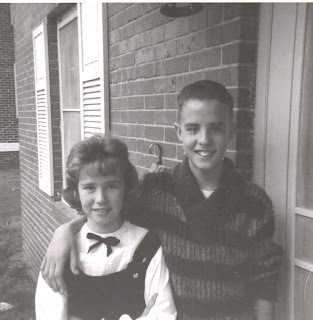 Yep, those were the days of poodle skirts, saddle shoes, white socks, rolled up jeans and the short lived "ducktail." 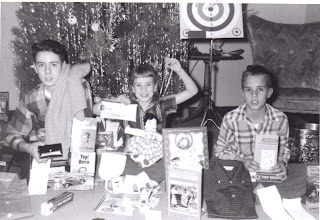 A simpler, innocent time filled with a treasure chest of memories! This is part of a meme that takes place on The Lazy Organizer every week. Click here to see what others have to talk about! Maybe you need this today. I know I did! I just want to share this with you. Sometimes being you takes courage. There is no one else in the whole wide world like you. I’m sure you have heard that before, but I wonder if you understand how true it is and how precious you are to God. We are not always treasured on this earth. Our relationships with our parents or friends or spouses can lead us to believe that we may be unique, but that it’s not a good thing. So often we are encouraged to blend in, don’t rock the boat, don’t be different, but I say, rock that boat, and be who you are. . . . When you hold back who you really are, we all miss out. So whether you are a pet nut like me or a wordsmith like Patsy Clairmont, whether you like high heels or flip-flops, be who you really are. You have a voice and a style that is all your own. It has been given to you by God so that through you, a unique picture of our Father is seen. Excerpted from Glimmers of Grace: Sparkling Reminders to Encourage You © 2008 Women of Faith, Inc. All rights reserved. My thoughts: You have a voice and a style that is all yours, give by GOD! Uniquely YOURS! We are fearfully and wonderfully made. Don't let others beat you down and make you feel less of a person for any reason! Hold yourself tall and put those shoulders back and tilt out that chin! God love you! He created you! Be the BEST that you can be! Outside my Window...a tree all decked out in Autumn array! I am thinking...how fast the year has gone and November is almost upon us! I am thankful for...a God who knows the beginning and the end. From the kitchen...Beef stew in the crockpot! I am hoping...to run to JoAnns tonight to get some felt that I need for a project I am working on. Around the house...I am noticing clutter making it's way on my kitchen counter.. going to attack that! Autumn floral arrangements warming my home, bringing in the season!! A Few Plans For The Rest Of The Week...Just my normal routine for now! This is a pic my daughter took of our little sweetie at the pumpkin patch. To see more, click here! This is a wonderful meme from The Simple Woman. If you haven't visited this site I highly recommend it. Her philosophy is just what the stressed-out mama/gramma/women needs to slow down and appreciate the simple things. Going to plan an easy menu this week! Planning to use up my leftovers! Want to see what others have on the menu? Click here! Todays challenge is to make pumpkin bread or muffins! And you know what? I am going to do that. We do love pumpkin bread. Doug is going for a ride today so I will have much of the day to myself. I will have a nice hot dinner ready for him when he gets home as it is going to be a chilly one out there today while riding that Harley. One of our friends is in Hawaii and her hubby is home alone and going on the ride so I have invited him to join us. The pumpkin bread will be tasty after a nice warm supper! If you would like to follow along on the 100 Days to Christmas or just see what others are doing, click here! This is cute and would be a great way to hang treats for the kids or visitors that come at Christmas time. Also could hold a monetary gift also. This would also be nice as a tag on a Christmas gift. I took on a huge project - decluttering and organizing my craft room. I came away with 2 large trash bags a couple of boxes and some other miscellaneous stuff in a pile for garbage clutter! You can see a picture of the garbage here! The rest of the "clutter" was taking up precious room on shelves and counters and floors! I boxed up 12 priority boxes and gave it away to friends that love to craft! I gave a large amount of scrapbooking goodies to my daughter in law and I have some goodies for my daughter. Fabric was carefully refolded and put away in containers for storage. Projects were containerized so that directions and materials would not get separated and could be picked up and worked on without major loss! It is a major monkey off my back to have this room decluttered and organized! YAHOO! 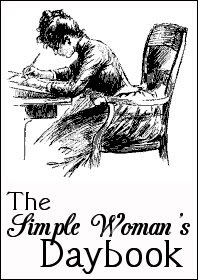 I am still working on my decluttering of my preconceived ideas of the Proverbs 31 woman and will probably share more of that next week. This decluttering challenge has been a huge accomplishment in my life. I hope and believe that I am developing some lifetime habits here to simplify my life! Many others have joined in this challenge over the past few months. Check out The Organising Queen for ideas from others and for Marcia's ideas and encouragement! Christmas is just around the corner. Today's challenge is to plan ways that you and your family can give to others in their need this Christmas! Christmas is NOT "All about Me!" What a wonderful time to teach our children to give to others, even when we may need also! Adopt a family to take the makings of a Christmas meal. Find a family in need and make their Christmas one they will never forget just by your kindness and generosity! Now is the time to research and make plans! Click here to read about 100 Days to Christmas and find out how others are preparing for the season! I took on a large procrastination challenge this month. 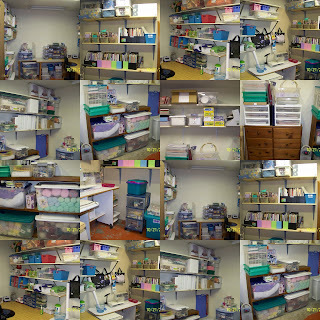 I really needed to get my craft room in order to begin my Christmas sewing projects. It was totally out of control as you can see from the bottom collaged picture. Piles EVERY where! The top collage is the completed room. The third picture is the stuff that I threw away. I gave away at least as much or more! It took me a little longer than I planned to finish this project. I have "something something" (I don't know the long word) vertigo. I found that being in this small room and moving my head up and down from the high up shelves and down that it made me very dizzy and headachy! lol.. so, I wasn't able to spend a long a period of times as I wanted. The room is organized although I don't think it is going to stay in this order. As I get out there more and use it and use up my supplies, I am sure that I will do more rearranging. I got rid of a lot of magazines and condensed the containers that I was keeping them in. The colorful containers were pretty but they took up more space than ordinary magazine holders. I have not labeled everything yet. I am waiting (no, not procrastinating!) for my granddaughter as she really likes to use the labeler so I will let her "help" me with that. I am so happy to have this done and I am so ready to start in on the dolls!!!! HURRAH!!!! Is there a project, large or small that you are procrastinating doing? Join in the challenge at Virtually Organized and/or just come on over and see what others are doing!! My Craft Room is DONE!!! OH MY WORD!!! What a project! But it is FINISHED! It isn't perfect yet, but it is decluttered, organized and ready for me to get busy with Christmas sewing and projects! I will probably have to address this in a couple of posts as #1 I don't know how to compress the pictures to get more in here and #2 this is my procrastination project too!! I struggled with this room for a lot of reasons. I have WAY tooooooo much stuff. I still do. But now it is easier to see what I have and keep after it so that it doesn't grow and take over the room! There are a couple of things that I will change in time. One is the huge plastic organizer/drawer thing that I got from QVC... I don't think I really like it but I will give it a chance for awhile. I am ready to start sewing and working on crafts in my clean and organized room!!!!!! 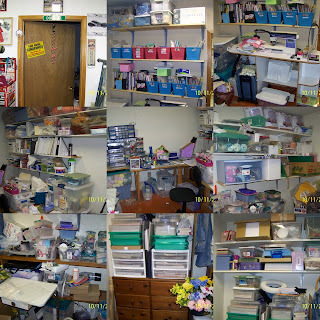 Some notes about my craft room: This is a room off the workshop in our garage. It was used as an office by the people from whom we purchased our home. It has a concrete floor that is partially painted. I would like to paint the floor again and I would like to paint the walls a nice soft color but that will come in time. The shelves are nice to have but they are not adjustable. Someday I would like these replaced with inexpensive adjustable shelves. This would really make for great organizing! The "table" is built in. It does not go all the way up to the wall in some areas leaving a gapping hole as large as 6"! lol I don't know what was their thinking on that one. Eventually it would be nice to redo this area also. But it does make a great scrapbooking area. I am thinking that I would like to rearrange some of it so that I could use it for a fabric cutting area also. The wall that is blank above some of my storage containers will have a bulletin board. View my collage of before pics here! If you would like to see what others are doing in their craft rooms. Checkout the Organized Junkie! In this economy, we are all trying to find ways to cut back, save money and energy and just be better stewards with what we have been blessed! I want to pass on this great e booklet that I found today. The purpose of this booklet is to give you key information and understanding of how much energy you use. With this knowledge, you will be able to make informed decisions and control your electrical energy and save money! This is in pdf format. I hope that you will find it useful. I know I am! Getting this up early today as several things are planned. Monday:Sloppy Joe Squares Edited to include notes: We loved this. I don't buy sloppy joe mixture so I just made up my sloppy joes and put that between the crusts. Very good. Will make this again. It was quick and easy! Heat oven to 350°. In a skillet, cook beef over medium heat eight to 10 minutes, stirring occasionally, until thoroughly cooked; drain. Stir in sauce. Heat to boiling, stirring occasionally. Unroll one can of the dough. Place in ungreased 13-by-9-inch (3-quart) glass baking dish. Press in bottom and half up the sides of dish. Spread beef mixture over dough; sprinkle with cheese. Unroll second can of dough. Place over cheese. Bake 30-35 minutes or until mixture is bubbly and dough is golden brown. Cut into squares to serve. To see what others have on the menu, check out the Organized Junkie! Time to Start Planning Christmas Crafts! I remember at Christmas, when I was a kid, mom would always make porcupine ornaments for the tree. I was never crazy about them but you know, they are a precious memory now. Mom never thought of herself as crafty but she had more talent than she realized. She must have given me my love of crafting. By second grade, I was using the sewing machine and sewing doll cloths. I made so many May day baskets and in Bluebirds/Campfire girls, we were always making something fun! I have a friend that has this crafting tradition for Christmas. The day after Thanksgiving, she meets with her sisters and sister in laws at one home. The whole family gets involved. Each sister brings her supplies to make a craft of her choice, usually holiday related. Each of them work all day long on their own craft, visiting and laughing, helping one another if needed. One husband makes breakfast. Another provides lunch and another provides dinner. At the end of the day, each sister receives a finished craft from each of the others and has her own finished items to take home. It has always sounded like such a wonderful time. In fact , it is what inspired me to start our family Mom and Daughter craft day that we just had! Perhaps you want to start a tradition similar to this! Maybe you are at a loss for ideas. Here is a crafting message board that I really enjoy. The Voy Craft board is filled with wonderful, helpful crafty ladies that are always willing to give their ideas and share websites. Give them a look see! And for helping you get organized and plan for the holidays, check out 100 days of Christmas! I have been working HARD this week. Every evening after dinner I have spent at LEAST one hour out working on the craft room. :) I have one huge trash bag of garbage (clutter) that is going out, out, OUT! The second picture is just SOME of the goodies from my craft room that I am giving away! I went through all of my magazines and got rid of MANY of them. I decided that I really want my Annies Attic magazines. The rest I only kept a copy or tore out a page if there was something that I REALLY felt I would make. Still a lot of work to do but there is definite progress! I want to get sewing soon!!! I am also working on decluttering something else in my life. Expectations of myself. While encouraging a friend this week, I realized that many times we and other "well meaning" acquaintances and friends, put expectations on ourselves that are not realistic. Perhaps it is the verses in Proverbs 31 that describe a Godly woman. I fall so short of those verses, and yet, I wonder if I am really reading them. Really reading them as God, Himself, intended them to be HEARD and understood by me. So I am going to read a little slower. 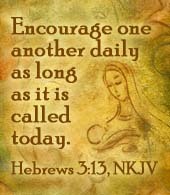 Take one verse at a time and ask God how to apply that verse in my life. What action or change needs to take place for me to be the woman of God He wants me to be. And I am going to try very hard to listen and adjust. I am going to "declutter" all the learned behaviors that I have regarding these verses. I am going to declutter my shortcomings from the past and forgive myself as God has forgiven and I am going to start with a clean slate. Come on and join us in one or both of these challenges! Christmas is approaching and having decluttered home will relieve much of the stress of the holidays! Click on the icons above to follow along! It is getting closer, No panic! The days are certainly getting numbered! And the days are certainly getting shorter! lol Today's challenge is to check into your Christmas gift wrapping supplies! That works for me. I have my wrapping supplies out in the craft room! So today I will go thru them, sorting through them to throwing out the papers and ribbons that are too ragged and sorting the bows and ribbons and papers and gift bags. Want to get organized for the holidays? Want to see what others are saying about their Christmas organization? Click here to visit One Hundred Days of Christmas! There is a GREAT giveaway this week for participating this week or even just leaving a comment on her blog! It is a fantastic Holiday eplanner from Listplanit.com. Check it out! Ok.... see! Now we are getting into the REAL look of my craft room.... I am making dinner and then heading out there to make a little more of a dent tonight. :) Someday I will be able to post after pictures. Outside my Window...Chilly, chilly cloudy day! I am thinking...About getting home from work, getting dinner and attacking my craft room again today! From the learning rooms...."Be Still and know that I am God." I am thankful for...the gorgeous weekend we had! I am wearing...black slacks, black shirt, black sweater! I am hoping...to get my hoodies finished this week. 2 of them for granddaughters. I also hope that I have enough yarn since there is one that I am concerned about! A Few Plans For The Rest Of The Week...finishing birthday gifts, working on craft room, birthday phone calls, birthday dinner, trimming the hydrangeas and tree peonies. The idea today is to complete or at least work on a project. I think THIS qualifies for that! Having this room completed will help me when I am making all those dolls! Want to see what others are doing today to prepare for stress free Christmas? Click HERE and see! Wednesday: Reuben Mac N Cheese (Rachel Ray recipe) edited to add: We liked this. I think next time I would add some caraway to the actual casserole. I don't think the rye bread that I picked out was strong enough to give it that "reuben" omph! To see what others are planning, Check out the Organized Junkie! This is a before picture BUT believe me when I tell you that this is the ONLY section of my craft room that looks this good! I am not kidding you. My granddaughter and I went thru my crochet magazines and books and organized them this summer. So it does get worse and I will post after pics... I may even get brave and post some more before. We will see. So, here is what I did today. I started carting things out and separating them out. I took some fabric that was still in the JoAnns bags, refolded them and put them in storage containers. They are on my dining room table where they will probably stay until I get the room in order. I packaged up 4 RAKS of crafting goodies that I am sending to 4 of my craft board friends. I will have more because I am going to be ruthless in this. I have set my priorities and my expectations so the journey to an organized craft room has begun. I didn't get as much accomplished as I would have liked because I am not feeling too good today but I can see some progress! This is the door leading into my craft room. The room this leads out of is my husbands VERY organized workshop! This poor room has gone from disorganized to almost organized to disorganized to almost and back again! Right now it looks like a bomb went off inside. I am bound and determined to declutter and organize and keep this room in order. I LOVE to craft.... but I hate going out to sew or craft in disorder. It bugs me. It isn't fun!!! Unfortunately I have company coming over tonight so don't have a lot of time to work on this today but hopefully tomorrow is another day! This is not a one day project, BELIEVE ME!!!!!!! So here is my start to the Round up! Oh, and by the way! Laura has been sent before pics of the room! I also teased, Marcia, with a couple! I think what I really love about 100 Days to Christmas? The fact that she keeps it real and she is not "rushing" the season! today she gave a recipe for popcorn balls and suggested that we make that today. Well, I am going to make my Fall Candy Corn balls instead but her idea is great! Enjoy the Fall with your family and friends!! Want to see all of her ideas and how others are following along, click here! Craft Rooms - Oh my!!! Countdown to Christmas - 83 Days!